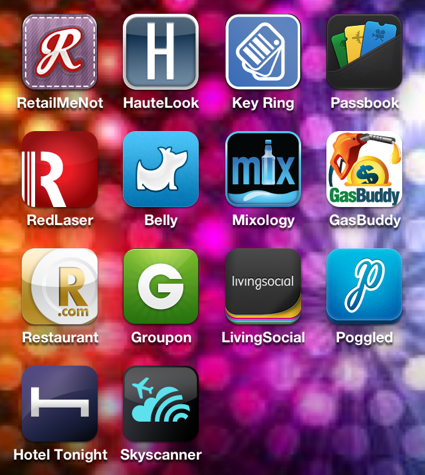 RetailMeNot and HauteLook are both shopping apps. You can find coupon codes for just about every store on RetailMeNot and then use the codes to shop online. Ebates, however, is quickly becoming my go to for online shopping. HauteLook offers deep discounts on many products (I use it mostly for the beauty section). Key Ring, Passbook, and RedLaser all offer to store those pesky loyalty cards for you so your wallet and/or key rings no longer weigh the extra 10 pounds! It may seem silly to have three apps that serve the same purpose, but they all have additional properties that make them unique. Key Ring links your cards to their websites as an added feature. Passbook can hold purchased tickets and deals until you’re ready to use them. RedLaser can scan barcodes on products and tell you where you can buy that product for the lowest price. Belly is similar in that it collects rewards for places you visit, but it’s not specific to any one place. Every place that is available is stored on the same card! Restaurant.com, Groupon, LivingSocial, and Poggled are all deals, all day! From food, to entertainment, to travel; these apps have it all…discounted. I will add Groupon and LivingSocial links to my sidebar so you can check them out whenever you like! Last, but certainly not least, Hotel Tonight and Skyscanner are fantastic for traveling. Hotel Tonight gives daily discounts on rooms for that same night. You just decided you want to live it up and get a hotel room for the night? No problem! Oh, you’re already on vacation and want to stay one more day? That can be arranged! Skyscanner will find the cheapest flights and show you which days are best to travel. It’s perfect for people with flexible schedules! I really hope you find at least some of this information helpful. We have so many money-saving resources right at our fingertips, we just have to know how to find them! Please keep in mind that I own an iPhone and have no clue what other app stores offer. I’d love to hear your feedback about any of the apps mentioned. Are there similar apps that you can’t live without? Please leave a comment and tell me all about them!